Near the peaceful railway town of Caliente in eastern Nevada, Kershaw-Ryan State Park is a small preserve covering an area of less than one square mile, centered on a narrow, spring-fed canyon which was first cultivated in the 1870s, associated with the nearby Meadow Valley Wash Ranch. 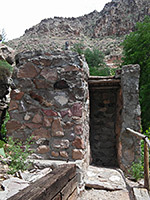 Today, visitors can tour gardens, view several stone structures built by the Civilian Conservation Corps in the 1930s, and walk the 1.4 mile Canyon Overlook Trail, which climbs above the riparian canyon floor to a viewpoint on the rocky slopes above, which are sparsely covered with cacti and small bushes. 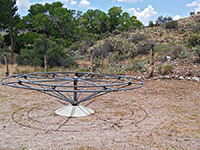 Other facilities include a picnic area, playground, wading pool and a 15-site campground; the place is not a major attraction, but is worth the short diversion for travelers along nearby US 93. 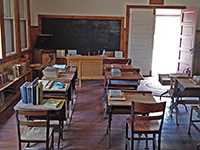 The state park also manages Elgin Schoolhouse, a single-room building in use between 1922 and 1967, and which contains much of its original interior, viewable by appointment. The park is named after two families that were influential in the settlement of this area; Meadow Valley Wash Ranch was established in Rainbow Valley by Samuel and Hannah Kershaw in 1873, and the nearby side canyon was soon cultivated, used for growing fruit and vegetables. 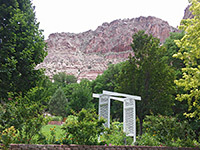 The ranch and the canyon were sold in 1904 to a cattle dealer, James Ryan, whose family later donated the canyon and its gardens to the state. 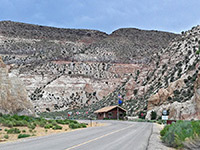 Kershaw-Ryan State Park is two miles south of Caliente along Highway 317, a scenic backroad that follows Meadow Valley Wash through a long ravine (Rainbow Canyon), continuing across higher, more open terrain past several tiny settlements and eventually (now an unpaved route, Hwy 4230) meeting Interstate 15 at Glendale. Elgin Schoolhouse is 19 miles south along the same road. The state park is reached by a short side road, to the east. The valley floor at this point is half a mile wide, bordered by steeply-sloping sides up to 600 feet tall, composed of layered, light-colored volcanic rocks which form some cliffs and other outcrops but mostly are sloping, covered by boulders and grass. 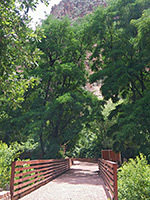 The side road leads one mile into Kershaw Canyon, which is similar in appearance to the main valley, but narrower, equally arid in most places except for a quarter mile stretch around the springs; here are found in the gardens and most of the facilities, though not the campground, which is on an exposed, gravel area at the canyon mouth. 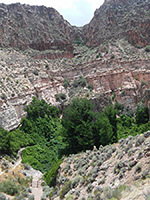 The Canyon Overlook Trail, a partial loop, leads a little further up the canyon then cuts back to a viewpoint on a promontory, 260 feet above the springs. 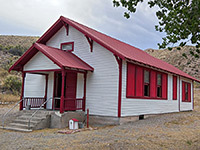 Elgin Schoolhouse was built in 1922, to serve the scattered settlements along the southern half of Rainbow Canyon, most of which were established at the start of the 20th century, when the Union Pacific railroad was built along the valley. James Bradshaw, a rancher, donated some land, at the edge of a wide section of the valley, most of which was used to grow fruit trees. Children were educated here in grades one through eight until about 1967, after which the building was used as a residence and then lay vacant for a while before being transferred to state ownership in 2005, protected as a state historic site. 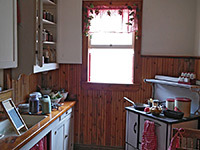 The exterior may be viewed at any time, but the interior can only be seen by appointment, on tours that are typically staged once or twice each month.